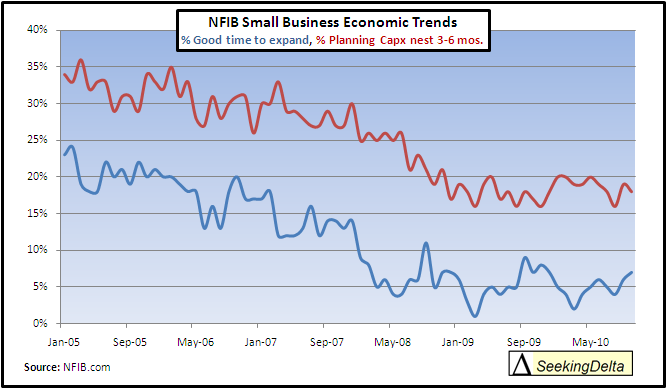 Last week one of my favorite pieces of economic data was released, the NFIB Small Business Economic Trend report. (pdf) This report, coupled with the Federal Reserve quarterly survey of senior loan officers gives us a good indication of the health of small business in the U.S. The NFIB headline optimism index rose 2.7 points in September but is still at recessionary levels. Let’s dig a little deeper by looking at a series of charts. 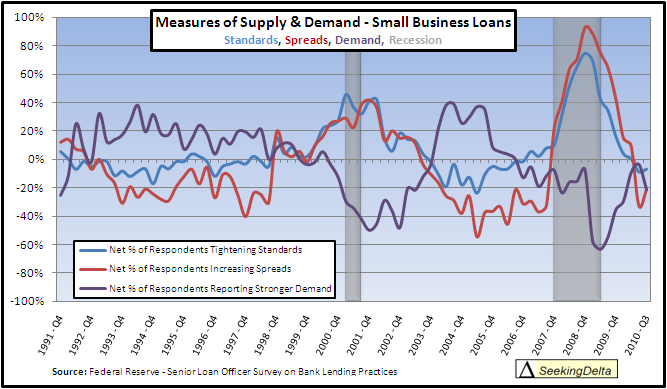 First up, is a look at the supply and demand of small business lending by examining the senior loan officer survey. As can be seen in the chart, banks have significantly loosened standards and decreased spreads from 2008 levels but respondents are still reporting weaker demand for loans from last quarter. The net % of respondents reporting stronger demand for small business loans was -21.4% in the third quarter down from -3.6% in the second quarter. The correlation between easier standard and shrinking spreads and an increase in demand is high, at 72%. We should expect higher demand for loans at this point. We can get an idea why there is still little demand for loans by looking at the next two charts. As can be seen, only 18% of small businesses in the survey are planning a capital expenditure in the next three to six months and only 7% feel it a good time to expand. 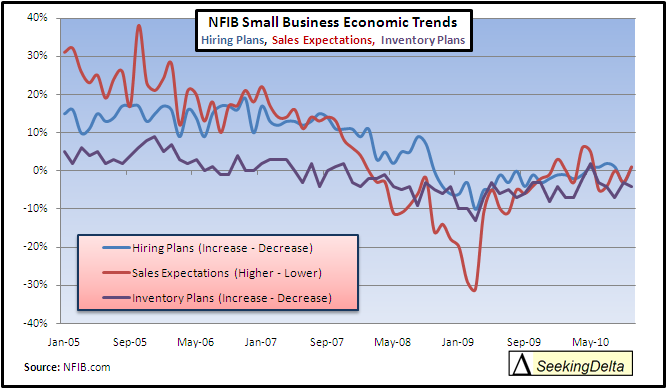 Furthermore, only a net 1% think sales will be hirer in the next three months with the same net 1% planning on hiring. A net -4% plan on expanding inventory. Due to this less than sanguine outlook, demand for loans are understandably low. 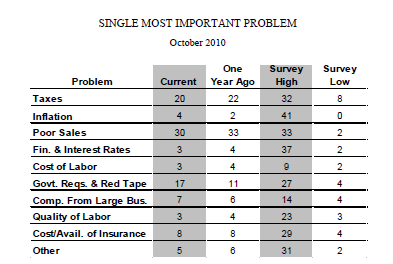 Finally, the lack of low rate funds are not the biggest problem faced by small business; in fact financing and interest rates are tied for last among the top ten problems faced. The top three problems faced are, in order, poor sales, taxes and government requirement and red tape.